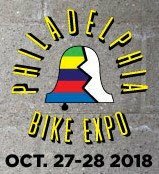 The Philly Bike Expo (phillybikeexpo.com) is a large, regional show featuring bike companies, artisan bike builders, bike-related equipment suppliers and bicycling organizations. (list of exhibitors) The show also hosts many seminars (schedule of seminars). Visit the CyclingSavvy booth (#1006) to learn more about CyclingSavvy and her parent organization, the American Bicycling Education Association (ABEA). To CyclingSavvy graduates and instructors, you are welcome to call our booth home and to share personal experiences about CyclingSavvy. This year, our booth will be a partnership with Eastern Pennsylvania local advocacy group, CAT-Coalition for Appropriate Transportation (LVCAT.org), advocating for bicycling, pedestrian access, trails and public transit in the Lehigh Valley (Bethlehem, PA). It’s easier than ever to buy tickets for the Philly Bike Expo, coming October 27 & 28 to the Pennsylvania Convention Center. Advance purchase can be made right at the PBE website, which will save you both time and money! An All-Access pass is the best value at $20 online, and it will get you admission to both days of the show, along with all seminars. A day pass with seminar admission costs $12 online, good for either Saturday or Sunday admission (but not both days), and a day pass without seminar admission is $8 online. Parents take note: children 12 and under get free admission all weekend! There are lots of things for kids to see and do at the Philly Bike Expo. Click here to go directly to the ticket sales page. Make your plans for this October right now!